Step 1: Remove the nozzle spray cap(?) from the perfume. 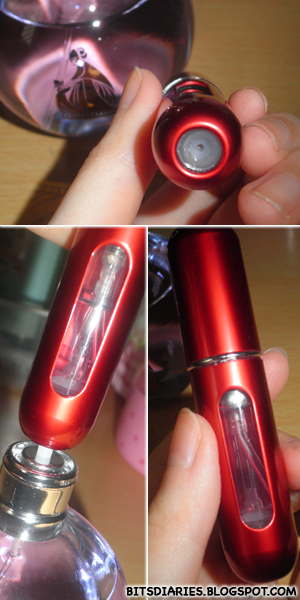 Step 2: Place the perfume atomizer spray upright on top of the perfume nozzle peg(?) stick(?) or whatever it's called. Step 3: Repeatedly pump up & down to fill~ Do not overfill! You can tell how much you have filled in the perfume atomizer bottle through the fill level indicator window. Red, Pink, Purple, Blue, Silver, Gold and Black. I got the red and pink one.♥ Might be getting the purple bottle in the future.